Here it is, Angry Birds Space full version finally available for Window PC, and you can download this version on your PC from the following link. Some days ago, Angry Birds Space launched for iPhone, iPad and Android devices and now Rovio has been launched the PC version. Angry Birds is the most popular smartphone game series, later made available for Windows PC users. 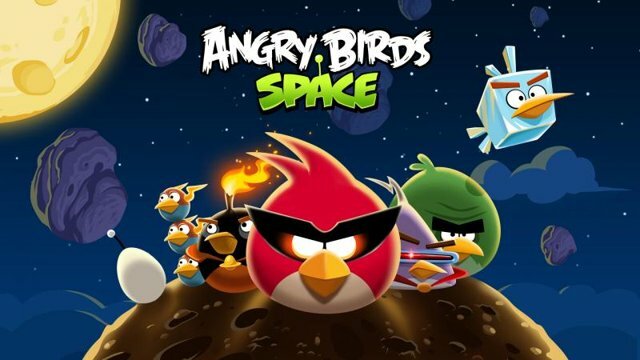 Recently they launched this game in new avatar named Angry Birds Space. You can download Angry Birds Space for android from here. Angry Birds Space features a new adventures on planets and in zero gravity, resulting in spectacular gameplay ranging from slow-motion puzzles to lightspeed destruction. With brand new birds, brand new superpowers, and a whole galaxy to explore, the sky is no longer the limit. Trick shots using planets’ gravity. Some birds have new powers now, and there are brand new birds, too. The yellow bird sports a purple spacesuit. It does more than merely speeding up. It has now got a special ability to change the direction in mid-flight and bang onto a target like a guided missile. The black bird, the one that explodes now wears a red and orange spacesuit. The large red bird is donning a green dress in the new version. Ice cube bird is a new bird introduced in Angry Birds Space. It freezes objects after the contact so that the other birds can break through obstacles. Another new bird is Lazer, it can use a supersonic burst of speed to destroy everything in its path. There are some requirement before installing this game, This game has been tested on OS Windows XP SP2, RAM 512MB, CPU 1 GHz Graphic, OpenGL 1.3 compatible. Download the game first and install it, and let’s see if it works on your machine. New in Gmail Labs: "Got the wrong Bob?" and "Don't forget Bob"